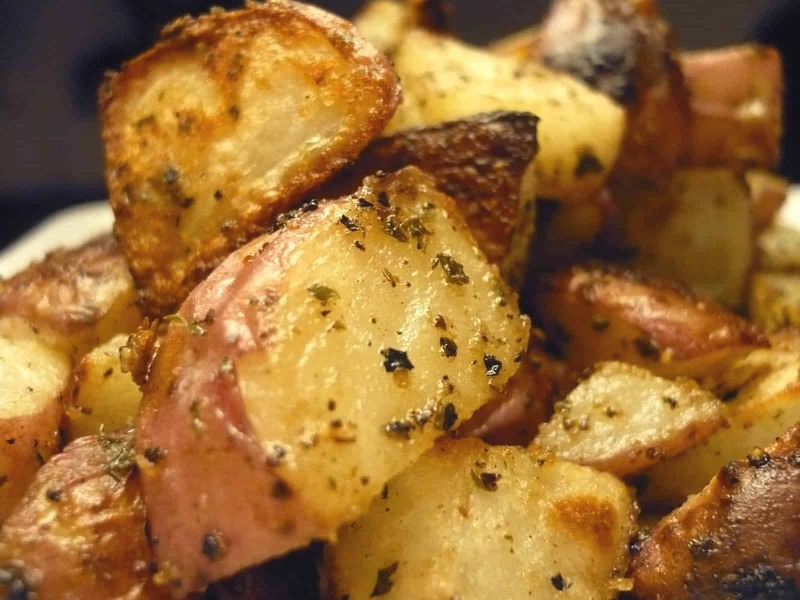 If you are looking for a quick and easy side dish recipe that tastes great and is low in Points, then this Ranch Roasted Red Potatoes Recipe will make you squeal with delight! It only requires a few ingredients, but you’ll be surprised at how amazing yummy these potatoes turn out. It’s a great, low-calorie potato recipe for any dieter. I make this dish for my family a LOT and they love it. Plus, these Ranch Roasted Red Potatoes go really well with a variety of main courses and is a great option if you need a fast weeknight meal side dish. This easy Ranch Roasted Red Potatoes recipe not only tastes amazing, but it’s a great accompaniment to a variety of meals. The pre-made Ranch Seasoning makes preparation a snap and adds fantastic flavor. In a large bowl add potatoes and spray lightly with the cooking spray. Then, add in the Ranch mix and salt, and toss well to coat each potato piece evenly. Spray a baking sheet with non stick cooking spray and spread out potatoes evenly on sheet. Bake in oven until potatoes are cooked through, and edges start to turn very dark brown, approximately 20-25 minutes. Serve immediately. Do you think that you could prepare these and the next day you could cook them? Simplicity at it’s best. Side dishes should be easy with very little fuss, and this one is just that. It’s one of the main reasons I love roasted potatoes so much. Line a baking sheet with aluminum foil, and there’s easy clean up too! Even when I bump this up to 1 lb. of potatoes, I still get 2 points plus in the recipe builder 4 servings. Yum! Even when I bump this up to 1 lb. of potatoes, I still get 2 points plus in the recipe builder. Yum! There is no such thing as nonfat olive oil cooking spray. Olive oil cooking spray is 100% fat. The reason why the package labeling states that one serving is 0 grams of fat is because they are legally allowed to state that if the calorie count is less than calories per serving, the total calorie count can be listed as zero. The serving size is so small, so short that most of us would have a hard time actually spraying that little. Any amount of olive oil cooking spray will add fat to your dish. Especially when our spray size does not equal that that small short spray that is considered one serving shown on the package. Always oil cooking spray is definitely not in nonfat product. It is 100% fat. So I put this in my recipe builder on my Weight Watcher app and this is actually 7points a serving if you use 4 as the serving size. The serving size needs to be 12 to get two points. Please research more before making/posting a recipe. When I put this into my WW recipe builder it is only 2 points a serving (4 servings total). This recipe sounds luscious. The only problem I have is that living in Australia, it’s tough finding dry salad dressing mixes. Can this be done using a ‘wet’ ranch dressing instead? Hope someone can help me!!! I was thinking if I could try this but replacing the olive oil for this virgin coconut oil that I just bought http://www.tiana-coconut.com/products/coconut-oil/. Do you think it will get the coconut taste? I LOVE coconut oil and try to use it wherever I can. But it DOES often leave a coconut taste. In this particular recipe I haven’t tried it, as I was afraid of that very scenario. What I would suggest is using avocado oil instead. It can tolerate high heats, and is a great substitute for coconut oil. But if you do try it with the coconut oil, please post back and let us know how it goes! I make this all the time with coconut oil and it always taste great. The stuff I use is flavorless. I highly recommend it. My family LOVES these potatoes! I make them once a week. I use more potatoes than what recipe calls for. (Enough to serve 6 instead of 4) that way the ranch is not as overwhelming! And that means we have left overs for breakfast the next day! Bonus!!! I just wanted to say this is a great way to make an easy side! I’ve made these quite a few times and I keep forgetting to comment. (Even though no one has commented in quite a while. lol) Like another person said, I also had to cook mine longer, about 40 minutes depending on how big you cut your potatoes. And instead of spraying with cooking spray I just tossed the potatoes with a little olive oil and the ranch seasoning with a pinch of salt and pepper. This will help with them sticking as well as spraying your baking sheet and/or tin foil. It also spreads out the ranch seasoning for the people who thought they were too salty. :) Make sure to also try with spicy ranch seasoning. Soooo good! Ok, just found this recipe on Pinterest(of course! ), and was super excited to try it out…used 12oz potatoes, 1 bag of ranch mix, and 1 tsp of salt….so followed the recipe to the T, and it came out so salty we couldn’t eat it!!! :-( Any clue as to what may have gone wrong? Made these tonight with taco seasoning… really spicy!! But easy and tasty. I did have ot cook mine longer, 40 minute or so. Use non stick tin foil. Works like a charm. We made these and I thought it was way too much seasoning on each piece of potato. I found the recipe on the Hidden Valley website and they say to use 2 pounds of potatoes so next time I will use more than 12 ounces. Man I can’t get enough of these potatoes!! I’ve made them twice in the past week! Thank you. I’d like to use up some of the regular baking potatoes I have at home. Do you think it’s ok to substitute? Mich, yes regular baking potatoes will be fine in this dish. Enjoy! It depends on the size of the potatoes. i bought the spicy ranch kind and they WERE FABBBBBBBUUUULOUS!!! ok probably not how you spell it but it was! Such a great way to jazz up potatoes. They came out perfectly seasoned and it was so easy. This will definitely become one of my staple side dishes. Those ranch potatoes were so good! Very flavorful!